If you have read many of the articles on this site, then you may have noticed that I was a big proponent of Any.Do for task management/to do lists. I loved the app but I kept hearing people talking about Astrid for task management. So I decided to try it out and I have to admit that it won me over. As a freelancer and consultant I usually have multiple projects and many tasks within those projects. 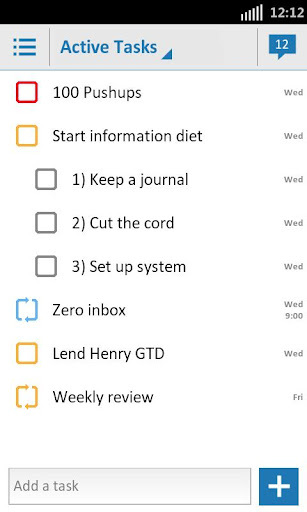 So a good task management app is a necessity. At the bare minimum I need to be able to add tasks and organize them by project. I would also like the ability to sync the tasks among multiple devices. Astrid gives me all of this plus much more. With Astrid, I can create a list for each project and then add tasks to that list. 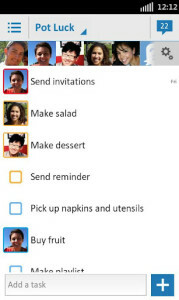 The tasks within that list can even be nested for sub tasks. Switching between tasks is simple and intuitive. Another nice feature Astrid has is the ability to assign tasks to others even if they don’t use Astrid. For instance, I added a task named “Generate Invoices in Quickbooks” and assigned it to my wife. She doesn’t use Astrid but she received an email describing the task and she had two options: “Sure I can help” and “Sorry Not this time”. When clicking on one of these two options, she is presented with a webpage which allows her to add comments to the task, which are visible to me, and mark the task complete. This brings me to the next feature which I really like. Astrid has a web based version which syncs with the Android and iPhone versions. I use Chrome as my web browser and Astrid even has a Chrome extension for “clipping” articles and webpages and making them actionable in Astrid. I use this for my blog. If I see an interesting app or article I can automatically create a task to revisit it when I have time. When I’m at my desk it is nice to be able to view my tasks on my monitor and not be exclusively tied to my phone. Astrid also has the feature which I really liked in Any.Do…the automatic prompting to add a task when you miss a call. This feature is worth it’s weight in gold in my mind. I forget to call people back so often and having this feature in Astrid keeps that from happening (as much). Astrid also features add ons which give it even more functionality. The Astrid Power Pack Add features more widgets, voice notifications, timers, and more. There is also a Locale add on for Astrid which adds location based notifications and tasks. Astrid is a very polished app with a ton of features. If you’re using another app (like I was) give Astrid a try…it’s free and I think you’ll be impressed.